You don’t have to be in the real estate business for long before you learn that you will need to take continuing education classes and real estate exams about every two years if you want to maintain an active real estate license. 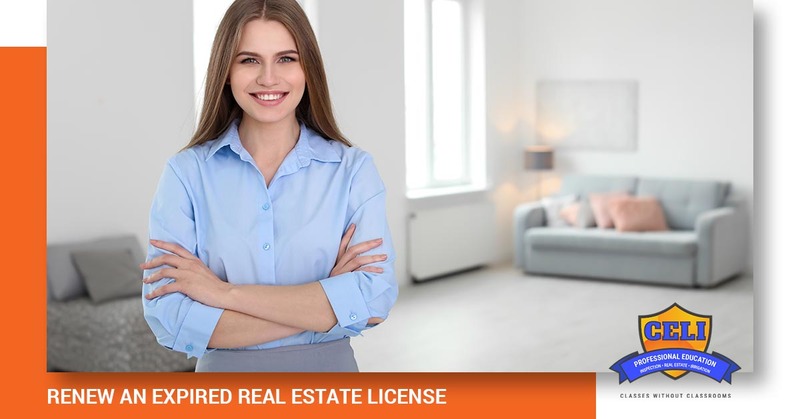 Continuing Education for Licensing knows just which classes are necessary for you to renew your license depending on your role in the real estate industry. Contact us today to speak with one of our professionally trained consultants and let us help you through the real estate license renewal process. Sometimes things happen in life that prevent us from meeting deadlines that we have long been expecting. Perhaps your spouse had a career change, you welcomed a baby into your family, or you helped an older child make the transition to college. If you had a major life change occur, and you missed the deadline for renewing your real estate license, then call Continuing Education for Licensing today and let us help you find the best way to renew your expired license so that you can get back to helping people buy and sell their property. Each state wants to make sure that their Realtors® maintain not only their knowledge of real estate from when they originally applied for licensure, but also continually learn about industry practices so that they are offering the best service in the most ethical and responsible manner possible. If you accidentally missed your renewal deadline and your license has expired, then you will need to make sure that you look at the requirements for the state in which you live. In Texas, there are a couple of different groupings based on the length of time that your license has been expired. If your license expired less than six months ago, then you will be happy to know that there are not many things that you will need to do. There is actually a grace period of six months, which means that you will follow the requirements as if you were completing a timely renewal. You will simply need to complete the required continuing education courses and submit the documentation of your completed courses along with your renewal application form. If your license expired more than six months, but less than two years ago, then you will need to request a reinstatement. Unfortunately, enough time has passed that you will not be eligible to simply request a renewal. Continuing Education for Licensing can help you locate the proper form to fill out and submit, as well as make sure that you are completing the correct continuing education courses. You may have experienced a change in circumstances that led you to put your real estate career on hold. If you are now at a place where you are ready to jump back in with both feet, then be sure to call Continuing Education for Licensing and let us help guide you in the right direction. If your license expired more than two years ago, you will need to reapply and pass the real estate exam again. Unfortunately, you will also have to take the real estate pre-license courses again, but if you did it once, you are sure to be able to do it again. Things are always changing everywhere, and the real estate industry is no exception. Continuing Education for Licensing wants to help make your real estate license process as easy as possible. We can guide you to the right continuing education courses for your role in real estate, as well as help you navigate the right path for renewing an expired license. Call today and let us help you renew your real estate license!